Buy Online Now! 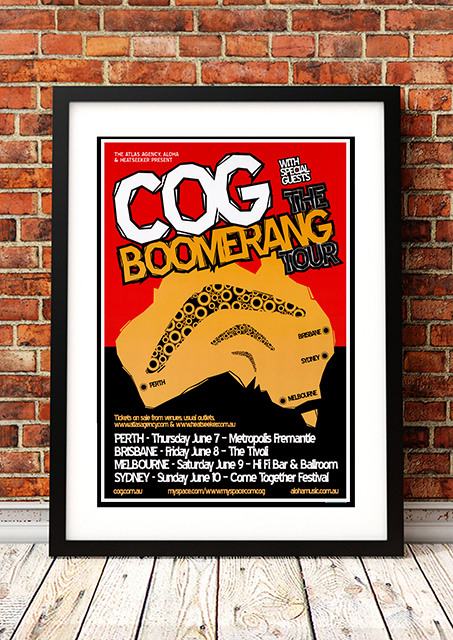 – Classic Cog Concert Posters and Memorabilia. 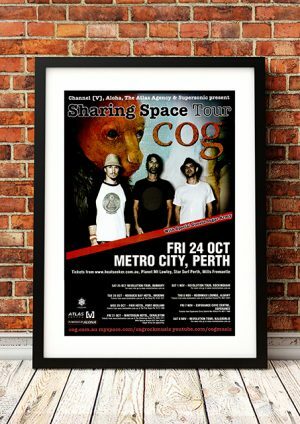 Cog are an Australian progressive rock band that formed in 1998. Their debut album, The New Normal, was released in Australia in April 2005, to a debut of No. 19 in the ARIA Charts, and a No. 1 debut in the Australian Independent Recordings (AIR) album charts. The New Normal was one of the nominees for the 2005 Triple J J Award. Cog played what many had believed to be their last show at The Tivoli in Brisbane on Saturday 12 June 2010, thanking their various crew members one by one between songs. The band finished with “No Other Way”, the opening track from their second album, Sharing Space. However, the band played four more shows – one at the Full Noise Festival in Townsville, one at a Sydney nightclub, and two smaller shows in the outer Melbourne suburbs of Frankston and Ferntree Gully. Their Sydney show on 22 December 2010 was Cog’s last show as a band, though they would reform six years later. 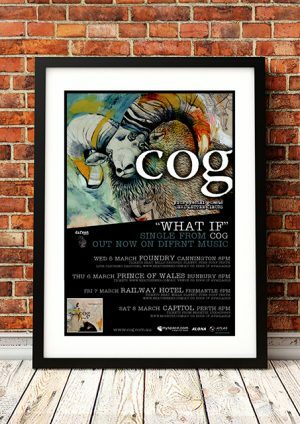 We stock an some awesome Cog prints.